Apparently today is Amazon Prime day, which means a bunch of junk you don’t need is slightly on sale giving you the impression you need to buy it right now. Sadly it doesn’t extend much to music—the few CDs they do have are ones that no one really wants to listen to. So we stick with $5 dollar digital downloads and a band that only lasted a few years, and you’ve almost certainly never heard of. Nashville, Tennessee is a great place to go when you’re a band looking to get noticed. Around 1999, Luke Reynolds moved there from Vermont, looking to start a band. He took a couple jobs at record labels trying to find other guys searching for the same dream. Finally in 2002 he met a bassist and they began working together. A friend of Luke’s who had a studio offered them some free time, so they recorded a few demo tracks. By happenstance, the president of Sony Publishing was there and offered them a contract. Feeling their sound wasn’t there and they didn’t quite have a band yet, they turned it down. Realizing they needed to move quickly to capture this lightning in a bottle, they found a mandolin player, drummer and a fiddle player to round out the group. Needing a name, the guys were fond of an old Zeppelin tune ‘Bron-Y-Aur Stomp’ which contains a lyric about a “blue-eyed merle” referring to a border collie. Blue Merle stuck, and the band was on their way. 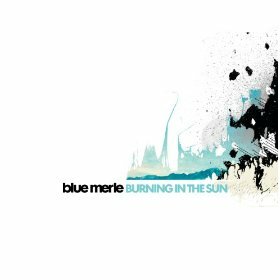 Three extended play albums aside, the only record Blue Merle released was Burning In The Sun in 2005. They had signed to Island Records and the label really seemed to be behind the album, pushing out a few singles and trying to get tracks used in different media streams. The album hit #8 on the Billboard Heatseekers chart and peaked at #199 on the Billboard 200. They were booked to play Lollapalooza in 2005 and had a fairly substantial tour on top of that performance. Luke’s vocals are often compared to Chris Martin of Coldplay or Dave Matthews, which are shockingly apt. There’s something so authentic and folky about his style that just sort of draws you in. While the band seemed poised to make a run, they broke up in April of 2006, with each member hoping to find greener pastures. In short, this album is awesome. I was introduced to it in 2006 by a friend who tossed me a CD with a bunch of random songs on it. “Stay,” “Lucky To Know You” and “Part Of Your History” were the songs I heard, and I think the next day I went out and purchased the whole album. Folk rock has always been a guilty pleasure of mine, but typically older stuff from the ‘60s and ‘70s. In many ways, this feels like a throwback to a different era, but with a more modern sound. Perhaps an original Coldplay—their early works are the most appropriate way to describe it to someone skeptical of turning in. A handful of tracks have been used on television since the breakup—but the album still never caught the fire everyone expected. Sometimes the best music is when you try out something new. I think anyone who enjoys folk, bluegrass or acoustic rock type genres will find this appealing. On a day in which Amazon will make millions on quasi-sales, stick it to ‘em by only paying $5 bucks for this album—it’s worth at least double that.